Let’s face it. Almost all of us have had frustrated pick-up experiences while ordering a cab online. Sometimes, the driver just can’t seem to find our pick-up spot and is equally inefficient in following the given directions. Other times, especially when are in crowded places like airports, with multitudes of cabs in the vicinity, all somehow with similar paint-jobs, it becomes difficult to identify our own cabs. With having to squint to read the registration plates on all cabs to identify our own, or even getting in the wrong cab, we have all had our share of frustrations. 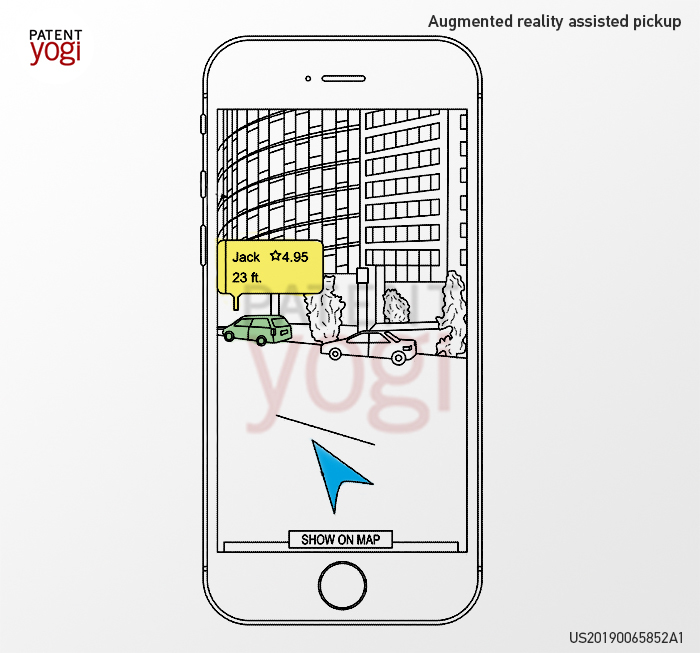 Well, no more, says Uber, as, per a recently published patent, they have come up with an exciting new AR based feature to help in identification of our cabs, and assist in pick-ups. As done currently, Uber will receive a ride request from you comprising service data like pick-up location, drop-off location, and maybe even a departure time if it is a scheduled ride. Then, based on the ride request, Uber will match you with multiple nearby drivers, and will send the pick-up details to the driver who accepts the ride request first. As the driver moves towards your pick-up location, Uber monitors the movement of the driver. On reaching within a pre-determined radius of the pick-up location, Uber will then send an instruction to your smartphone to display a live feed using the camera of your smartphone. Then, based on the driver details, like vehicle make, model, color, and registration number, Uber performs image recognition the live feed, and determines when the driver visible in the live video feed. This image recognition is performed using a trained model to predict that an approaching or stationary vehicle is your cab, by calculating a vehicle score, which is also based on driver information. Then, as shown in the figure below, Uber overlays AR elements onto the live feed to indicate that an approaching vehicle is your cab. Although technology is not groundbreaking, it definitely has the makings of tech that will be used by millions of users daily. This tech is a little step ahead by Uber in insuring that riders have the smoothest possible riding experience.